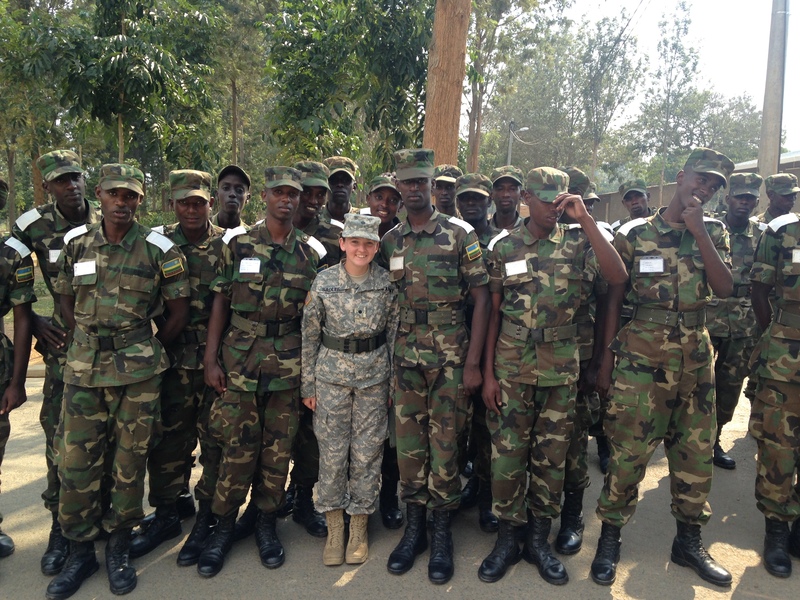 When I heard Cadet Sadler was going to Rwanda the first thing that came to mind was the Rwandan genocide and we are sending a young Cadet who just finished her freshman year to “that” African country. Needless to say I was very interested to see what she had to say about her adventure, and she didn’t disappoint. My main mission was to improve relations with the Rwandans and help the Rwandan cadets improve their conversational skills. In addition to being implanted into a platoon at the Rwandan Military Academy, my team also helped paint classrooms for an underfunded primary school. Lastly, we went on a variety of cultural field trips in order to fully understand the country and it’s unique history. June 22nd the day that changed my life forever. I have never been out of the country before and now I was being thrown head first into not only a culture very different from ours but more importantly I was being thrown way out of my comfort zone. The main thing I remember that helped get me through the first Rwandan drill and ceremony practice was all of the smiling faces. In among the hitting, pushing, and yelling these random new people took me in as one of their own. In the beginning the cadets would correct me and help me understand what was going on at their own expenses. The cadets would be hit or made to do push-ups because they were not in position due to the fact that they were guiding me. The harsh way the cadre hit, punched, shoved and yelled at the cadets is a part of their culture. My buddy, buddy Erica told me this was normal, they grew up with physical punishments. These actions were frightening at first but the more I thought about it I understood the background behind their use. In order to command a platoon one needs to be strict and strive for perfection. Another aspect that was brought into perspective due to spending so much time with the Rwandan cadets is to always appreciate the little things. Even thou one can’t change events you can change your attitude. The cadets always had a way to make even the worst situation better with smiles on their faces. One of my fellow cadets and friends enjoying the Army presents I gave her. During the early morning ruck march I got to talk to another girl in my platoon. I wasn’t really getting into the conversation because I didn’t get much sleep the night before. A few minutes later we are both laughing and joking. She had gotten even less sleep then I had and still managed to bring me out of a slump while walking miles upon miles all with a smile on her face. I will never forget that conversation. The strength to push through any obstacle is a big part of the culture. I think that is amazing because here in America people have gotten lazy and just take the easy way out or give up. In order to be a strong leader one needs to lead by example and when things get challenging be the person to pull your soldiers out of their slump. One positive action can act like a catalyst. The way Rwandans have made it their mission to forgive and grow after such an earth shattering event can’t even be explained by words. The strength and faith it takes for a person to forgive their families killer is unfathomable. The things I learned from this example the Rwandan people set is to be able to move on and have the strength to admit your mistakes and learn from them. This lesson is what I think is the most important thing a leader needs to know. Only a great leader can look back at their mistakes, learn from them, and move forward while trying to never making the same mistake again. This resilience and hindsight is essential for one to lead effectively. Every experience I had over in Rwanda has changed the way I think about everything I do. I will never forget the people I met over there for they have touched my heart and changed me in ways even I don’t know. I will forever remember this trip to Rwanda and more importantly I will remember the strength, selflessness, and smiles of my fellow cadets, Rwanda Military Academy Intake 06/16 B-Company Platoon 1. Nice article Rachel. Very moving regarding the life and kindness of the Rwanda people. Despite your small stature, your mental strength and your empathy will make you a great leader.